Because kids need wisdom to make good choices and to deal with the many challenges they face in our broken world, Christians through the centuries have taught them wisdom from Proverbs. But Marty Machowski—father, family pastor, and best-selling author—knows how easy it is to lose sight of the gospel when teaching a book like Proverbs. 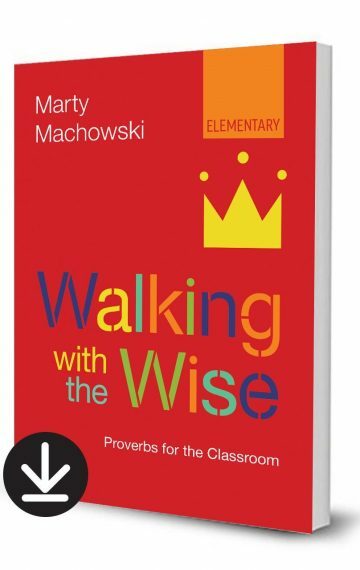 Walking with the Wise: Proverbs for the Classroom is Machowski’s twelve-week curriculum for four- to twelve-year-old children that connects the book of Proverbs to God’s larger story of salvation. Instead of teaching moralism, each lesson deftly connects the moral truths of Proverbs with our need for gospel grace. Children will learn that Solomon’s wisdom, life, and failures all point to “something greater than Solomon”—they point to Jesus, from whom real wisdom comes. The easy-to-use curriculum engages children on three learning levels—Pre-K–K (ages 4-5), elementary (ages 6-10), and middle school (ages 10-12)—presenting the wisdom of Proverbs against the backdrop of the gospel to show that real wisdom comes only as we depend on Jesus for daily help and forgiveness. Each lesson includes Bible reading, creative object lessons, questions to spark discussion, scripts for dramas and puppet shows, downloadable visuals and board game, and age-appropriate crafts and activities. A corresponding Walking with the Wise music CD is available in addition to the companion family devotional, Wise-Up: Ten-Minute Family Devotions in Proverbs to reinforce the truths learned at church as families explore them together at home. Both resources will help to make learning the truths of Proverbs fun and memorable and will point children to the true wisdom that is only found in Christ. The curriculum is also available for PreK-K and Middle School.